What is a Mediterranean diet? We would say nothing more than a diet rich in vegetables and fruit with a greater presence of fish and with the unavoidable olive oil. You would not be mistaken to say so, it is precisely Mediterranean cuisine that has proven to affect the health of the entire cardiovascular system, it works on digestion and regulates body mass. 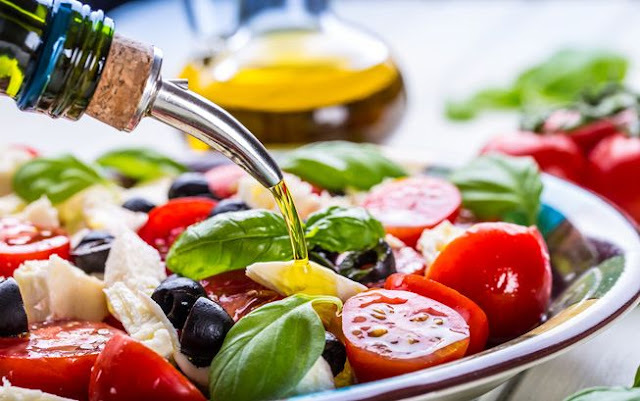 As we mentioned in our blog the most diverse diet for weight loss, we came to the conclusion that some of them are not easy to implement, as opposed to a Mediterranean diet where this is not the case. In the continental parts Mediterranean cuisine is not so represented, Logically – since they are not near the sea. People who live in the coast are totally indifferent to the whole life on such a diet, eating healthy. What science confirms is a significantly smaller number of cancer patients and cardiovascular diseases just in these areas. Healthy diet and Mediterranean diet go together and are recommended by doctors and nutritionists. As seen from the menu examples, most of the red meat from the diet was excluded. Eat fish at least 3 times a week and avoid frying food. Drink at least 2 liters of liquid per day. Eat lots of fruit and vegetables every day, the best ones are seasonal fruits (watermelon, melon, grapes, figs, apples, oranges). Although it contains calories, you can use olive oil in small quantities with every meal. Avoid all forms of processed industrial foods (snacks, sweets, etc.) because they are full of harmful trans-fats. Avoid sunflower and soybean oil, but use olive oil for everything. In addition to fish and chicken, eat rabbit meat, and you can sometimes eat lamb or the like. Stay away from other types of meat. Milk, yoghurt and other dairy products may be consumed but limited to those products that have less than 2% fat. Every day you can drink a glass of wine, it positively affects the heart and cardio vascular system. Is a form of healthy life and nutrition, in this statement, cardiologists from the American heart association have agreed as well as many doctors-nutritionists. Relaxed lifestyle without stress, healthy food, and beautiful nature make the Mediterranean a magical place to live in. Often it is enough to spend a short time at sea during the summer vacation, in order to feel this perfect harmony. Nothing prevents us from undertaking Mediterranean diet and, above all, for the Mediterranean cuisine to become part of our everyday life, wherever you are.